Less popular than its neighbor Spain, Portugal remains relatively unknown to Americans but holds much for travelers to discover. Although far from isolated, it has generally avoided tourist inundation and retains a rich cultural identity. It has also kept away from the high in-country costs associated with Europe. Once I met the challenge of getting there for under $500, keeping costs down was a cinch. To make a short escape to this coastal Iberian country feasible, I concentrated my travels on just one area. The easiest and cheapest way to capture the flavor of this vibrant region was to fly into Lisbon and stay there for the duration of my trip. Admittedly knowing little about the city, I was delighted to find more than enough fun things to fill a long weekend. And despite the euro hitting its peak while I was there, I still managed to raise cultural experiences to the max. By requiring a trip across the Atlantic, a complete escape to Lisbon does not come without its price and logistics. My saving grace was going at the beginning of the off-season. For Lisbon, that meant not leaving until the calendar flipped to November, literally. The difference between traveling the last week of October (my intent) versus the first week of November meant the difference between going for under $500, and, in my case, not going at all. Although prices will remain low throughout the winter, the seasonal cusps (late fall and early spring) are the best times weather-wise. During my stay, temperatures hovered around 70 degrees and the skies stayed sunny, a stark contrast to the snow I came home to. The most expensive component to a Lisbon escape is the airfare, which I priced no lower than $320 round-trip. Add in taxes and fees, and it quickly jolts above $400, not leaving much left for hotel and other transportation. My way around it was to book air and hotel together through dynamic packager Expedia, which consistently has the lowest Lisbon prices. My package came to $482 and included round-trip airfare from New York, three nights at a tourist-class hotel, and taxes and fees. Booked separately, I would have paid at least $40 extra and gone over budget. For that price, Expedia offered Hotel Miraparque, which was tidy and efficient. Although lacking frills and charm to rave about, the hotel did throw in complimentary full breakfast each morning and was conveniently located just north of the city center on Park Eduardo VII. It was one block from a metro stop and three blocks from a bus stop with direct access to/from the airport and downtown. Another source for consistent under-$500 vacation packages is Go-today, which specializes in affordable and independent Europe vacations. This provider almost always has an air-hotel package from $449 departing from New York, before taxes. Add on $50 to $360 extra for other cities. These added costs might seem steep, but you’re actually getting a longer stay (six nights opposed to my three) for a similar value. For a little more, Abreu Tours reliably offers Portugal-exclusive escapes, including packages to the Azores. The key to my savings while exploring the city was the Lisboa Card. Available for one, two, or three days, it provides unlimited public transportation and free admission to most museums, as well as deep discounts to the rest. Plus, it kept me from having to juggle change any time I wanted to go somewhere. I bought the three-day version for 27.50 euros (about $36). Figuring the cost of the nine museums I visited and 14 rides I took (including airport transfer), I did better than break even. The savings kept me content, but the one who benefited the most was my arthritic mom, who accompanied me. Lisbon is a fairly large, hilly city, making it difficult for her to get about. However, being able to hop on a bus, tram, lift, or metro at any time allowed her to keep up. Plus, we both got a rise out of riding the antique funicular trains uphill in some of the older sections of town. Lisbon is divided into sections—some old, some new—that have distinct character. I covered a lot of ground by walking through each area and stopping at sites along the way. Belém: This section located slightly outside of downtown holds the mother lode of museums and monuments. One of the most exciting was the Mosteiro dos Jerónimos, a 16th-century monastery, which holds the tomb of famous Portuguese explorer Vasco da Gama. Perhaps more awe-inspiring, however, was the Monument to the Discoveries built in 1960 to celebrate Portugal’s maritime heroes and other notables. The Torre de Belém (possibly Lisbon’s most iconographic site) and Museu Nacional dos Coches (coach museum) are also worth a visit. Bairro Alto and Chiado: Chiado gets snaps for its elegant shops, and the Bairro Alto owns the city’s nightlife scene. Experiencing fado, a musical genre unique to Portugal, is a sure way to immerse in culture. I saw a show at Caldo Verde (named after “kale soup”), which was one of the few houses open on Sundays. The house was filled with locals singing along while the friendly staff made me feel right at home. Many proprietors of the bigger, touristy houses try to bamboozle people inside. It’s best to pass over these places if you want a more authentic experience. In general, most houses only charge a 10 euro cover, and that’s only if you don’t eat or drink. The area does get a little gritty at night, but if you’re careful and vigilant, it all becomes part of the scene. Baixa and Restauradores: These sections were rebuilt in a modern grid layout after Lisbon’s devastating earthquake of 1755, and serve as the city’s major commercial center. As such, they bustle with shops, cafes, and restaurants. I enjoyed walking around and popping into cake shops (pastelarias), but was bummed that nearly all the retail stores were closed because it was Sunday. Save this part of town for any other day to get the most out of it. Alfama and beyond: This area holds one of the largest concentrations of my favorite thing about Lisbon: the decorative tiles (azulejo). My mom, an artist who paints on fine ceramics, and I became a little obsessed. We started out admiring building facades with the tiles, but then quickly got pulled into Feira da Ladra, a market held twice a week where local vendors sell pottery, antiques, clothes, and original wall tiles. The pinnacle for us was the Museu Nacional do Azulejo (tile museum), set in a 16th-century convent a bit east of the Alfama district. If I could have seen only one thing on my trip, this would have been it. Food in Lisbon is very inexpensive, certainly the cheapest I’ve ever seen in Europe. Lunch at a famous cafe in Belém, Antiga Confeitaria de Belém , cost only $8 for the two of us. This memorable spot features a large pastry counter, decor (azulejo tiles everywhere), and walls filled with bottles of port behind lock and key. Another cafe to stop at, although a bit on the touristy side, is the Brasileira Caf&eacute in Chiado known for its past clientele of intellectuals and writers. For dinner, small restaurants are the best bet for satisfying meals at good prices. The two I enjoyed the most were Casa do Alentejo, set in a fascinating 19th-century house in Restauradores, and amiable Alfaia Restaurante near the fado houses in Bairro Alto. Others I liked included O Policia near my hotel, and Bota Alta also in Bairro Alto. In most restaurants, waiters will automatically put small appetizers, like bread, cheese, and meats, on your table. You only pay if you eat them. From what I could tell, Lisbon has appeal to intrepid and more conservative travelers alike. Portuguese, not Spanish, is the language, and English is understood less than in other European countries. Some travelers, like me, see this as culturally invigorating. However, other types can rest assured that the people’s welcoming warmth can help anyone find their comfort zone. 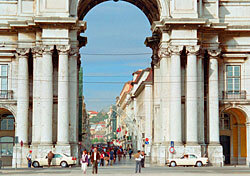 Add in all the enriching activities and favorable prices, and Lisbon makes for an ideal escape. For me, the short city visit was the perfect enticement to return and explore more of the country. I heard Porto is very nice. Dear Readers: Although my strategies can help any traveler find value, I realize that many of the destinations I have covered benefit those living on the East Coast the most. I try to include a variety of destinations in the poll (to the right) that are accessible from varying parts of the country. Remember to vote to make sure your voice is heard.